in honor of Pearl Harbor Remembrance day. Large crowd gathers for guided nature walk with USFS field ranger Matt Riggen. Photo by Charles Biles. Learning about about the salmon life cycle on a guided nature walk. Photo by Charles Biles. 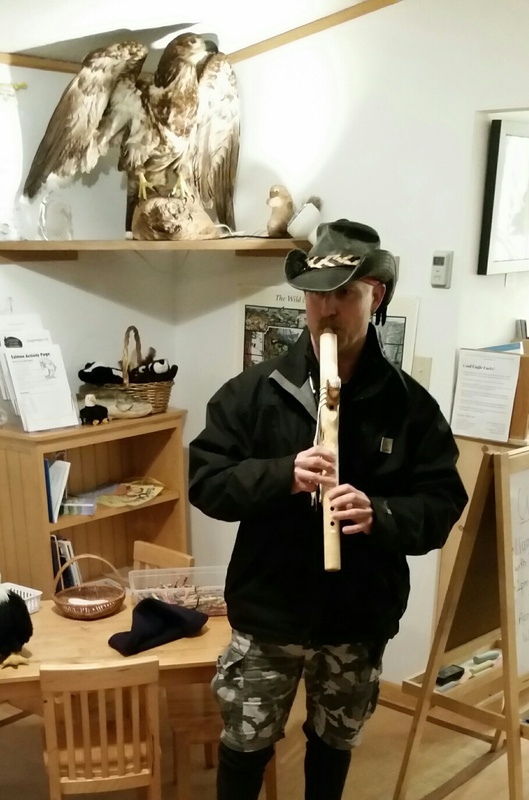 Visitor shares music from his eagle flute. Click image for full picture. School group poses in front of the Center's giant eagle kite. Click image for full view. Students feel the different types of evergreens that have been planted along the Skagit River to improve wildlife and salmon habitat. What's a lungwort? - students discuss lichens with the Center coordinator. Finding out about the longest lichen. Stopping to talk about the salmon and trout that live in the Skagit River. USFS Field Ranger describes the characteristics of a juvenile bald eagle before leading Guided Hike. Kids huddle around the eagle's nest replica during our K-12 School Program. Eagle perched inside the park on a sunny winter's day. Our Team posing with our new sign from Skagit County Parks & Rec. Find handmade items in our Nature Store - unique gifts locally produced. Shop in our Nature Store - featuring local Skagit Valley artisans. Proceeds support both the artist and Center. Our neighbor, Don Smith, from Rockport State Park draws an eagle for the kids in our children's corner. Interpretive Center Coordinator pauses to discuss spawning salmon on a very snowy guided hike. 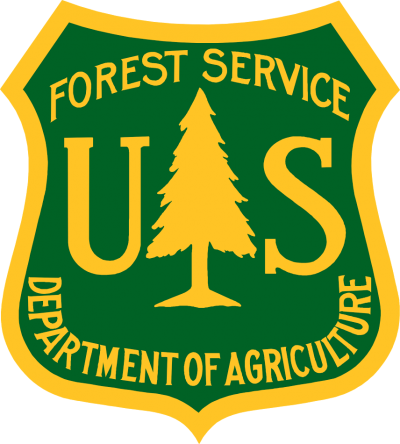 The Skagit River Bald Eagle Awareness Team (SRBEAT) is the 501(c)(3) nonprofit organization that operates the Interpretive Center. 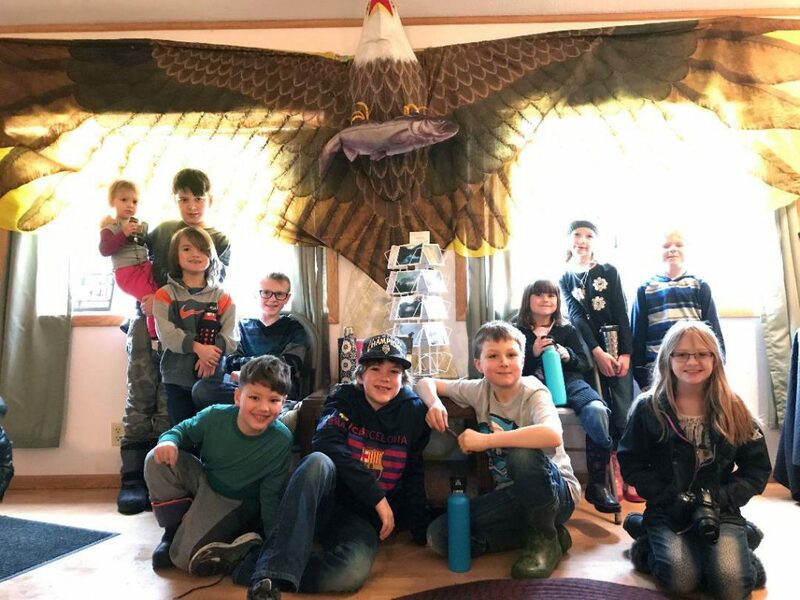 The Skagit River Bald Eagle Interpretive Center at Howard Miller Steelhead Park, Rockport, WA offers opportunities to better understand the Skagit River ecosystem with an emphasis on the winter migration of bald eagles, salmon, and the vital role each play in our environment. Each weekend in December and January we offer Guided Nature Hikes along the scenic Skagit River and a Speaker Series. Our educational programs include a K-12 & Home School Program and Community Group Tours. We are a 501(c)(3) nonprofit organization that does not receive any government funding. We depend on volunteers and donations to stay in business. Who: We are a 501(c)3 nonprofit dedicated to educating the public about the Skagit River ecosystem – because we really love it here. Give a presentation on topics relevant to the natural history or ecology of the Skagit River watershed. Keep reading to learn more about volunteer opportunities! Serve the community and support environmental education by joining our team! For more info contact, srbeatic@frontier.com, 360-853-7626. We cannot fly without you. Join us in our mission of environmental education and conservation. Click here to make a donation today. View our Top 20 Photos HERE! Grand Prize: Alan Ross – “Winged Victory” – Skagit River, WA. Thank you all for making the contest a success! Kids Photo Contest – Must be 15 years old or under to enter. Grand prize to be determined.